Do you have itchy, irritated skin caused by swimming? You may be suffering from chlorine itch. Learn how to reduce the effects of pool chemicals (including chlorine) on your skin and how to naturally protect swimmers. This post uses affiliate links, see Policies and Disclosures for more information. Chlorine itch is the term used for the sensitive itchy skin you sometimes develop after swimming in a chlorinated pool or hot tub. The itch may be caused by a sensitivity or allergy to chlorine… or just plain over exposure to chlorine. Luckily there are easy ways to reduce the effects of pool water chemicals (including chlorine) and naturally protect swimmers. Pools and hot tubs in the U.S. are treated with chlorine to prevent illnesses caused by germs and bacteria found in water. Municipal water systems are also treated with chlorine, EPA guidelines allow up to 4 ppm of chlorine in drinking water (tap water). We are lucky to have a safe water supply in the United States, but it is important to understand the undesirable effects of chlorine in our water as well. My kids swim year round for swim team and recreation. I love that they are interested in a sport they can participate in whether they are 5 or 95. But spending several days a week in the pool can wreak havoc! Swimming in a chlorinated pool means exposure to known skin irritants that can cause skin to become dry and itchy. Research suggests that chlorine in swimming pools can increase rates of asthma, cancer, and skin/throat irritation. When chlorine mixes with water it forms hypochlorite, a bleaching agent that causes fabrics to fade (Ever notice how faded swimsuits get?). In addition to direct risks, chlorine reacts with organic matter to form chemicals known as trihalomethanes, commonly called “disinfection byproducts.” These dangerous byproducts (including chloroform) are released when chlorinated water reacts with organic matter from swimmers such as sweat or urine. You can read more about trihalomethanes in the EWG 2013 Tap Water Guide. I hate exposing my kids to dangerous substances but love the enjoyment and exercise they get from swimming. What’s a parent to do? Wear a swim cap and goggles. A tightly fitting swim cap and pair of goggles prevents the chlorinated water from further reaching the hair and eye area. Get wet before swimming and rinse off afterward. Wetting skin and hair reduces the amount of chlorine you skin and hair can absorb. Create a layer of hair protection. 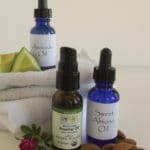 Spray damp hair with an All-Natural Hair Detangler and Protectant (see my easy recipe at end of post). 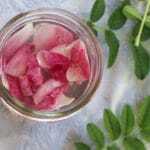 Apply a thin layer of natural oil (i.e. avocado, almond, jojoba, argan, or coconut oil) to skin. This light barrier further prevents the amount of chlorinated water your skin and hair can absorb. Smooth the oil on while skin is damp to protect without becoming a greasy blob. 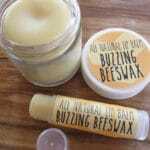 Use a natural balm to protect lips. 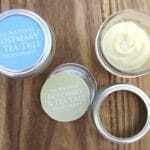 My kids use my all natural Healing Dry Skin Balm on their lips, knees, elbows and other dry spots. 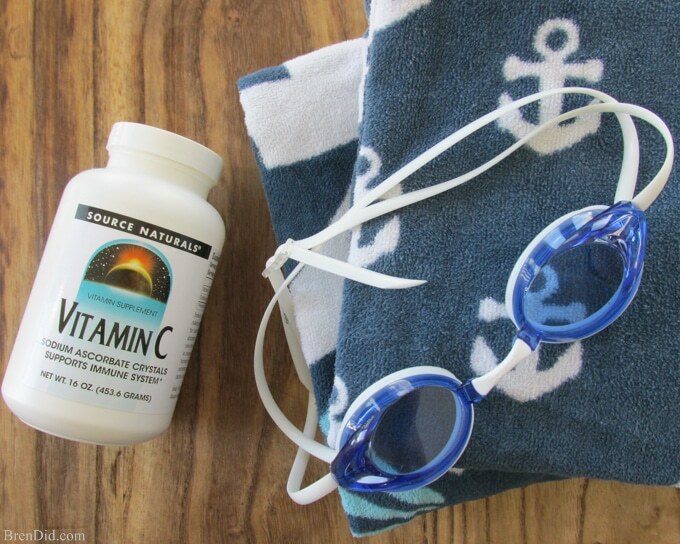 Treat skin, hair and swim gear with a vitamin C solution. 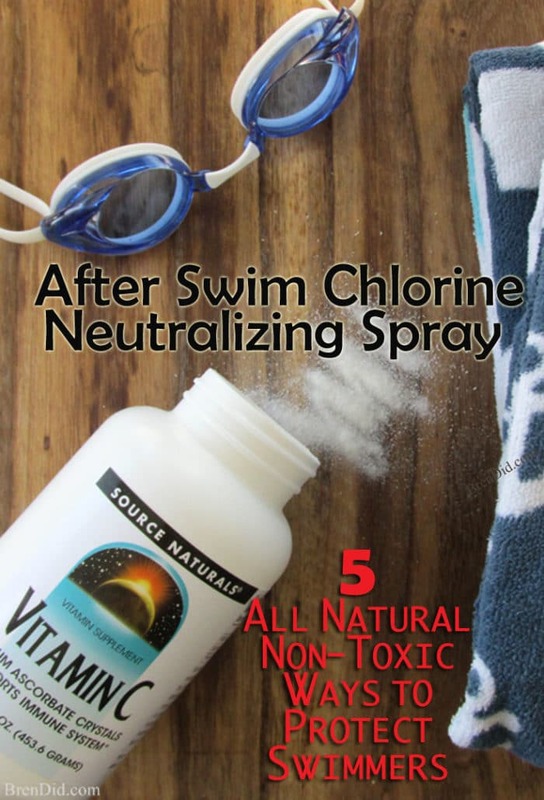 Vitamin C naturally neutralizes chlorine! I make After Swim Chlorine Neutralizing Spray. See the full recipe below. Both ascorbic acid and sodium ascorbate (two common forms of vitamin C) will neutralize chlorine (neither form of vitamin C is considered a hazardous substance) according to the USDA. Use: Generously spray After Swim Chlorine Neutralizing Spray all over immediately after swimming. 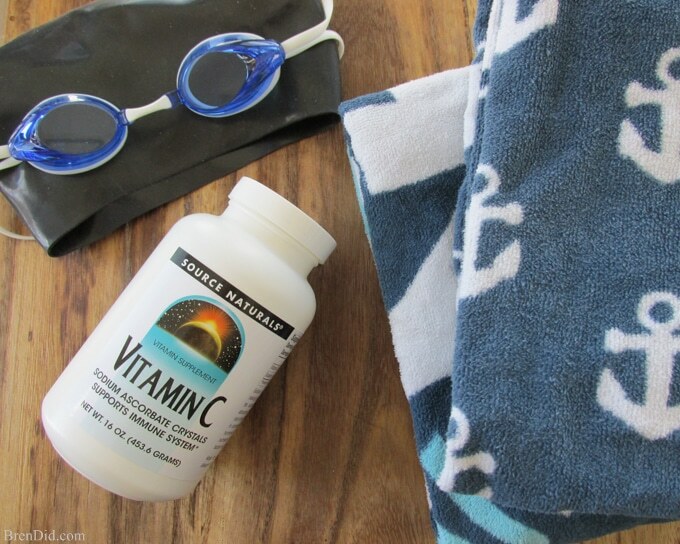 The vitamin C neutralizes the chlorine. *Tip: Add a teaspoon of sodium ascorbate to an empty 8 oz water bottle and bring it to the pool. After swimming take the bottle to the shower and fill with water, shake to combine then dump over your hair and body. Both ascorbic acid and sodium ascorbate are affordable and have a shelf life of at least one year in a dry form (stored in a cool, dark place). However, once it is mixed into a solution, the vitamin C degrades in a day or two. Mix just enough solution to use each day. 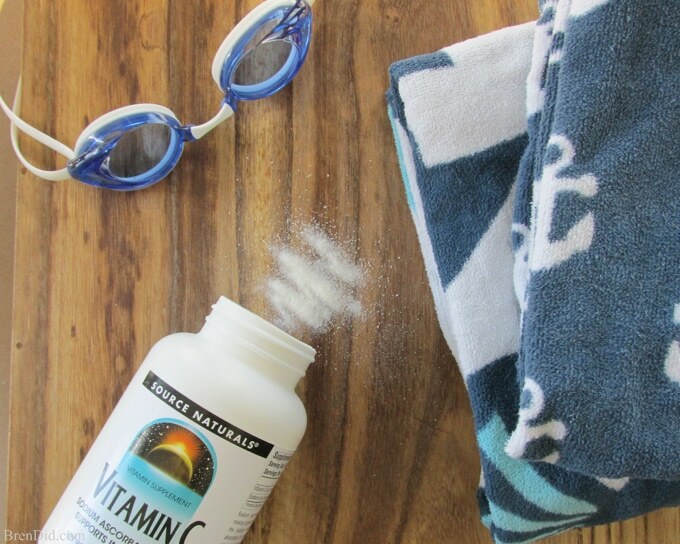 I currently use Source Naturals Vitamin C Sodium Ascorbate Crystals to make my after swim spray. It cost around $15.00 for 16 oz (approximately 189 days of After Swim Chlorine Neutralizing Spray at $0.08 a day). A similar natural product costs $11.95 for 6 ounces (about 12 days of spray). We follow a simple spray and shower routine to naturally protect ourselves from chlorine damage. After swimming spray off with After Swim Chlorine Neutralizing Spray (recipe above) then change and come home to bathe. Carbon water filters in all of our home showers to remove chlorine. Bonus, the filters help keep my shower mold & mildew free and I have to do less scrubbing when cleaning! The shower attachments screw on with no special tools, we even take them with us when we move. For extra protection: Mix vitamin C into shampoo or body wash to neutralize chlorine or add a few teaspoons of vitamin C to the bathtub. You can also use Vitamin C tablets in your bathtub. Rinse swim suits in a bucket of water with a teaspoon of sodium ascorbate after each use. Pour the whole bucketful (water, suits, and all) into the washing machine, add a scoop of non-toxic detergent, run the washer on the delicate cycle, then hang suits to dry. When I'm feeling lazy I toss the suits into the washer with a few teaspoons of sodium ascorbate and detergent then run the delicate cycle. Wet hair before each swim. Wet hair can absorb less pool water. Apply a natural product that helps prevent chlorine absorption. Wear a tight swim cap. Combine all ingredients in a glass spray bottle. Shake to combine and shake again before applying. Use a few light sprays as a detangling spray after washing or apply generously to damp hair before swimming to protect hair. Combine 1 oz of natural conditioner (use your favorite non-toxic conditioner) with 8 oz of distilled water. Combine all ingredients in a spray bottle. Shake to combine. Use a few light sprays as a detangling spray after washing or apply generously to damp hair before swimming to protect hair. I hope these tips and tricks help you naturally protect your hair, skin, and gear so you can keep swimming! Like my natural beauty and body care tips? 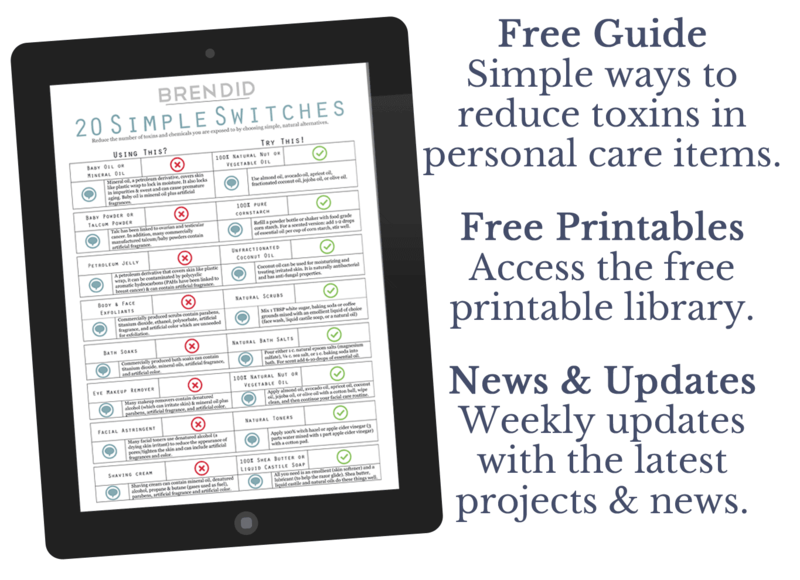 Sign up for my free newsletter and never miss a thing. I would suggest the vitamin c spray and a doctor visit to rule out a chlorine allergy! Ascorbic acid is about half the price of sodium ascorbate. Will it work as well? Your choice. I spray my kids before they shower. I make the spray before we head to the pool. Thanks Sheila! Hope it helps! I would read the tablets to see what they are made from… both ascorbic acid and sodium ascorbate will neutralize chlorine. You can then dissolve the tablets in water to make the solution. To relieve the itch you could try a moisturizing bath with oatmeal or try using a natural oil as lotion. I would try the tips for removing chlorine from your shower/bath water too. Good luck! Any suggestions for protecting our girly parts from chlorine. I go to aqua fit classes a few times a week. It’s a better option for me for my knees. I too get itchy and will try your spray. My doctor explained it as swimming with your mouth open with respect to our girly parts and wondered if there was a way to protect that region. I’ve tried using coconut oil and wondered if that would do anything. I’m not sure about that one, sorry! Hi… I’m confused about the suggestion to use natural products as a protection on your skin and hair. Aren’t the nasty byproducts created when chlorine comes in contact with organic materials? So wouldn’t applying organic/natural products to your hair and skin before swimming actually make the situation more toxic? I might be missing something, so please explain. Thanks! Emily, the natural products are used to create a barrier so the by products are not coming into direct contact with your skin. Vitamin Shoppe has the powder calcium ascorbate. Is this the same as sodium ascorbate? It is my understanding that calcium ascorbate is a combination of calcium and ascorbic acid. Sodium ascorbate is a combination of sodium and ascorbic acid. I would check with your vitamin seller to see if they can be used the same way. I have only used the Sodium Ascorbate. My name is wilfredo, first of it i’ll began by saying, I have 2 kids swimming 3 times per week minimum, 1 an-half hrs every time, we belong to a swim team for the last 7 years, and I have been swimming for the last 3 years in a 25 meter pool and sometimes a 50 meters for 2 time per week each is 1 hrs, all this pools are full of chlorine, but we love the sport, i also have a whole house filtration system to remove the chlorine and fluoride. 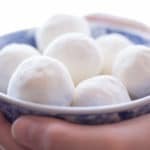 The smell never goes away from swimming gear, desperately looking for a solution I came to this site! I am happy that I am about to join you guys! Question for anyone of you? After you guys have try this, is there more effective method to use this or mix? The (Sodium Ascorbate Powder with coconut oil or similar) or Is that a bad idea? Your feed back is very important. Hi Wilfredo! I understand the chlorine smell issue. I would try the Sodium Ascorbate Powder mixed with water after you swim. You can mix it in a spray bottle or add a few spoonfuls to a bath so you can wash is chlorine free water. I think you will see a big reduction in chlorine smell after a few days. Good luck! Thank you for the reply, I am pitting 2 full spoons of sodium ascorbate on a plastic bottle when kids come out of the pool they fill in with water giving a good shake,-and pore in the head down and make sure they cover the entire body, WORKS EXCELENT, I Swim 2 days per week and I am using it. I’m so happy to hear that you are having great results, Enrique!